our website visitors are humans and they generate emotions as they read through your content. 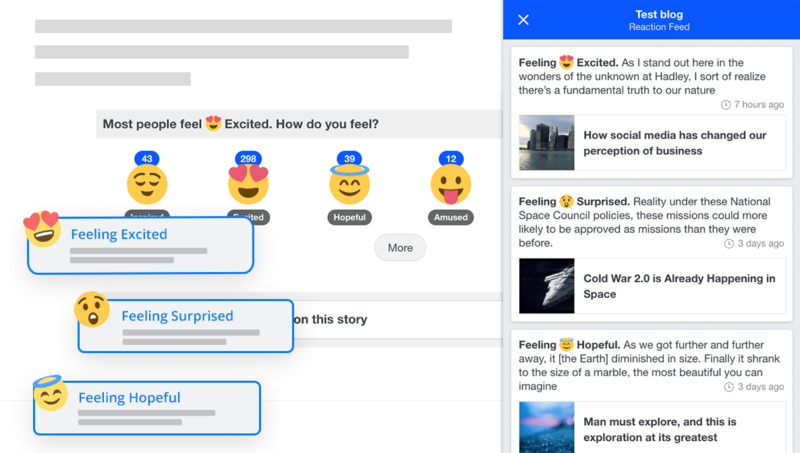 The AI powered reaction widget boosts the engagement by suggesting them most relevant emotions to react with, as per the story. 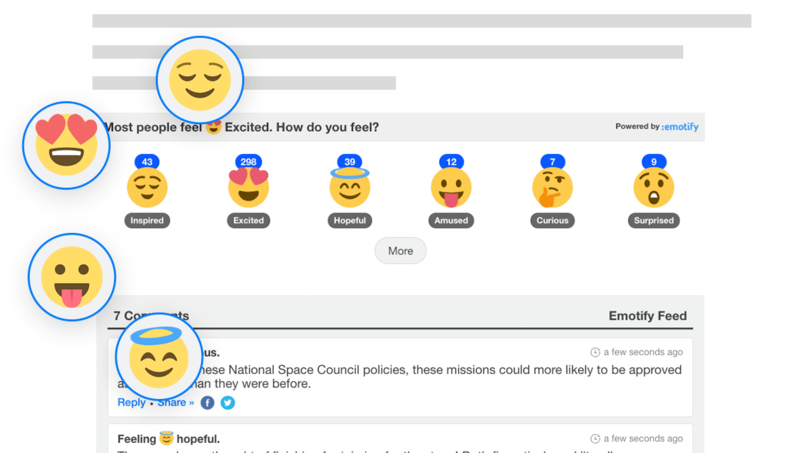 Real-time comment and reply system to elevate engagement, without any intimidating barriers of traditional commenting systems. Machine learning and keyword based auto-moderation to reduce human effort in keeping the site clean. 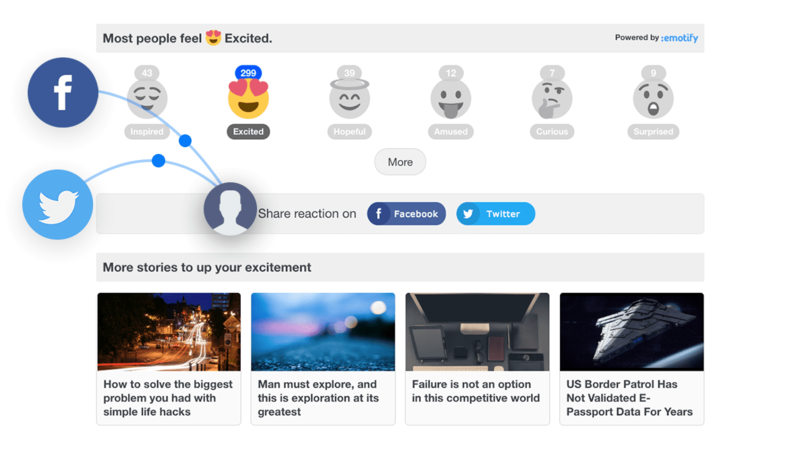 Emotify lets your visitors share their reactions along with the stories. Shared content is boosted by user's reaction associated with it, which makes it more personalised and improves the engagement on social media by a huge factor. Emotify personalizes your website for every single visitor by suggesting relevant stories to them based on their current reaction. The machine learning powered smart recommendations keeps the site fresh and personalised for every user. 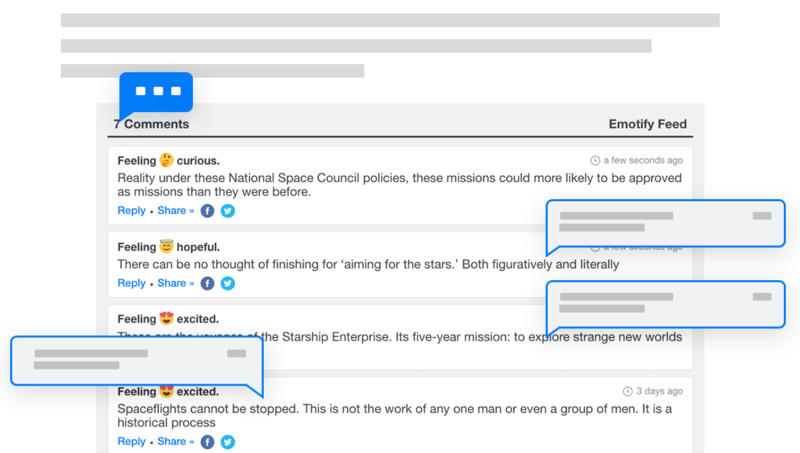 Real-time feed of audience reactions and comments on the stories throughout your website. 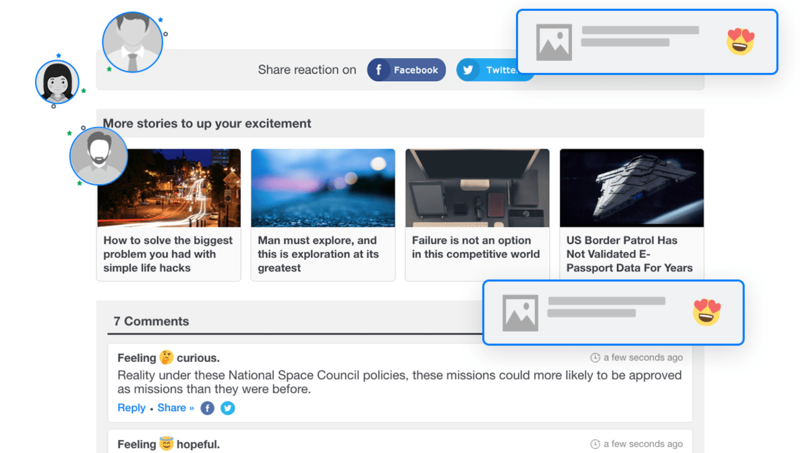 Reaction feed lets your website visitors discover and engage with more stories from your website and adds the social element. 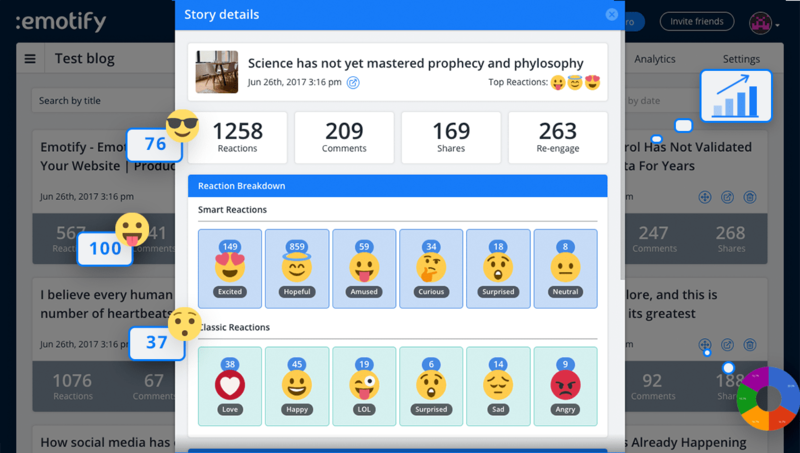 Emotify gives you a powerful analytics dashboard with invaluable insights about your audience reactions and engagement on your website and stories. Manage websites, team and customise Emotify from the dashboard. Engage your audience like never before and explore untapped potential of your website. Emotify is the most human way of connecting with your audience and empowering them to engage better with your website. Emotify adds personalisation layer to your website and makes it way more interesting, interactive and engaging for your audience. You’ve always been wondering about the impact of your stories on your audience emotions. Now measure it for real. Emotify makes people spend more time on your site and boosts page views, content visibility, audience interaction and revenue. I love that feature when @goemotify suggests me more stories from the website which matches my current mood. Really smart idea. I believe @goemotify can fill the gaps between online publishers and their audience, which have never been filled by commenting systems. Own a website or a blog? Check out @goemotify which lets you get user reactions and enables reengagement with your visitors. Very effective! Available soon on more platforms. Copyright © Emotify, 2019. All Rights Reserved.